Whoever comes, I'll kill them. I'll kill them all. (SPOILERS) There’s no guessing he’s back. 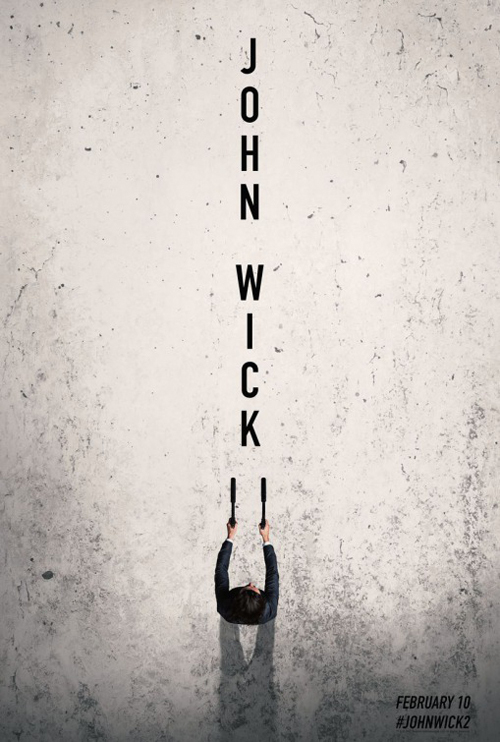 John Wick’s return is most definite and demonstrable, in a sequel that does what sequels ought in all the right ways, upping the ante while never losing sight of the ingredients that made the original so formidable. 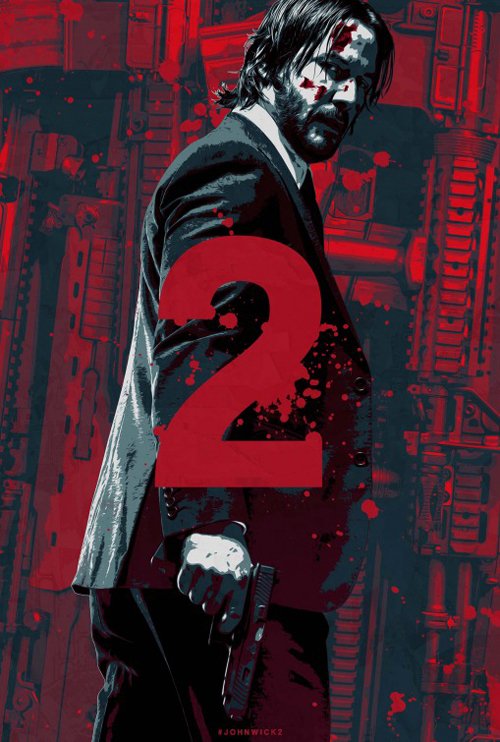 John Wick: Chapter 2 finds the minimalist, stripped-back vehicle and character of the first instalment furnished with an elaborate colour palette and even more idiosyncrasies around the fringes, rather like Mad Max in that sense, and director Chad Stahleski (this time without the collaboration of David Leitch, but to no discernible deficit) ensures the action is filled to overflowing, but with an even stronger narrative drive that makes the most of changes of gear, scenery and motivation. The result is a giddily hilarious, edge-of-the-seat thrill ride (don’t believe The New York Times review: it is not “altogether more solemn” I can only guess Jeannette Catsoulis didn’t revisit the original in the intervening three years – “aspirational buttocks” about sums up her take) that does on a modest budget what most blockbusters fail at with four or five times that amount. One thing that failed to occur to me following the original was how John hadn’t got his car back. Perhaps because he had a new pooch to fill his void. I wrote that I “suspect he might have let the car go without… serious reprisals” but the opening sequence works entirely to relinquish such notions, as John pursues it to Peter Stormare’s chop shop, gets it seriously dented (to the returning John Leguizamo’s consternation) and lets Stormare live to change his ways; one wonders if Stormare, like Common, is set to return in the final instalment, having been shown mercy. Although, as Larry Fishface’s appearance as the Bowery King shows, there’s no guarantee that the once spared will feel indebted. Stormare’s on fine cigar-chewing form (he narrates John’s mythic status effectively, for those who didn’t see the original, but for whom such details don’t really matter, any more than needing to see Mad Max or The Evil Dead did before their sequels), but the scene itself might be the movie’s weakest action piece (I say that purely relatively). Maybe this is because it’s largely auto-related, rather than the up-close-and-personal deployment of gun, knife and fist (although they do get a look-in), or maybe it’s because it’s narratively such a conscious overhang of the first film, but it’s only when Riccardo Scamarcio shows up as Santino D’Antonio, looking to cash in John’s marker (which John secured with him on leaving the game; returning to the fray gives D’Antonio the right to call it in) that the picture truly takes off. And then some. I don’t know D’Antonio’s work, but he makes a feast of being a hateable little so-and-so with a New Romantic quiff (the only disappointment, performance-wise, is actually Fishburne, who admittedly isn’t serviced with the most riveting of roles but still seems to be going through the motions whenever I catch him in anything these days). And the job he gives John makes a welcome break from the linearity of the original (I’ve seen this complained about as a momentum killer, but I’d argue it rather ensures a more appropriate rise-and-fall pacing that suits the relentless, exhaustingly-sustained action sequences; if nothing else, the Bowery King episode gives the viewer a much-needed break where fatigue might otherwise have set in – this is 20 minutes longer than the first, but fully justifies its extension). The “jaunt” to Rome enbales an invigoration of setting, ideas and editing. John is fitted for suits, for guns (courtesy of Peter Serafinowicz, on much better form here than his Guardians of the Galaxy turn) and checks in to Franco Nero’s Rome Continental (eliciting one of the movie’s choicest lines: “Then humour me with but one question. Are you here for the Pope?”) When it comes to the assassination of D’Antonio’s sister Gianna (Claudia Gerini), whose snuffing will enable D’Antonio to take her place, returning screenwriter Derek Kolstad has the dramatically compelling idea of her taking her own life – going out on her own terms, just as she lived – and Stahleski shows the same kind of care with a subdued, atypical character scene like this as he does with his action (it might be the picture’s most unexpected and affecting interlude). And, when the action revs back up, it’s an almighty tornado, as John shoots, stabs, kicks, punches and wrestles it out amid an operatic, moshing techno heaven (there’s a marvellous moment when the crowd cheers as John takes out several assassins on stage: all part of the performance), to the accompaniment of Ciscandra Nostalghia’s songstress and a guitarist who appears to be modelling his posturing on the Doof Warrior (another area where Chapter 2 scores significant points on its predecessor is that returning musos Tyle Bates and Joel J Richard offer more variety on the soundtrack, rather than a non-stop metal dirge). Retiring to the catacombs, the delirium of the dead and dying piles ever-higher, with perhaps the only (only? there are, admittedly, numerous, if you wish to resist the picture’s heightened lure) question mark being that John manages to place his supporting weapons in exactly the places his retreat requires. Common also offers a strong showing as Gianna’s ward Cassian, the most formidable of the assassins on John’s trail when D’Antonio decides not to honour his agreement and puts a $7m hit on Wick (which will also tidy any loose ends). Stahleski offers some interesting – as well as very funny – choices during this return to New York, the aesthetic refreshment of Rome apparently having done him the world of good (although, it was actually vice versa, production-wise, so put it down to the influence of his director of photography). We have already seen the retro processes of the assassin’s trade (tattooed secretaries utilising untraceable analogue typewriters for communication), and the one-shot transition to the urban locale becoming a human minefield, in the space of a simple message being received, is electrifying – all hell breaks loose. But, instead of sticking to a straightforward succession of opponents, Stahleski mixes it up. The interactions of Cassian, a massive Sumo-looking guy (impossibly, ludicrously hard to kill) and a female violin-wielding assassin cut about, before settling on Cassian’s pursuit of John (in between, more dazzling manoeuvres ensue as we’re given evidence of how Wick kills with a pencil – albeit, two rather than the three victims of legend). This entails a wickedly cheeky, casual, two-tiered shootout across the pristine white expanse of the Oculus, judiciously avoiding any members of the public, and culminates in a brutally-enthralling subway fight that leaves Cassian with an impacted aorta. I’ve seen it suggested that some of the fights fall down on a viewer involvement level in comparison to the first outing, because they lack the sense “they’re happening to real people in real places”. What I think they’re getting at is there isn’t always a visceral vitality; that – as with the first, so redundant if it is claimed this diminishes the sequel – there’s occasionally the sense of bad guys just walking into John’s path as cannon fodder, putting up no defence, which I put down to the realities of the extended one-take technique. That’s something that isn’t untrue of the Hong Kong cinema that influenced this approach, though. And honestly, on that level, Chapter 2 works for me more alluringly than the first; for all the video game, virtual shooter feel that rears its head at times (the series could certainly do without the reliance obvious CGI squibs), it’s aesthetically more inspired and enticing (notably, the article singles out the opening for praise, which as I’ve said, is the least arresting sequence; it also throws out the kind of comments that makes me wonder why some people go and see action movies – like why does no one aims at John’s head). That review/chat also draws attention to the fight with Ruby Rose’s Ares as a disappointment, on the grounds that she’d been built up as the true nemesis. I felt this was exactly the point, however. Ares darts about like a crazy mosquito, but like so many others (even Cassian, ultimately, and definitely D’Antonio – no one ever listens to Winston) she has been hoisted by her own petard (and why wouldn’t she be, she’s from a younger generation who probably didn’t think all that talk about Wick stood up to scrutiny). The backdrop to this confrontation, the hall of mirrors of the Reflections of the Soul exhibit, is overtly set up as John’s descent into hell. Which might be a bit naff on paper, but Dan Lausten’s cinematography is so striking (a definite step up over Jonathan Sela’s samey palate) that it works in the picture’s favour rather than against it (this is, after all, a series not really interested in subtleties – it invokes its protagonist staring at a photo frame for motivation – only in iconography, and should continue to be so). Chapter 2 features many natural progressions from the first, however, such that the development translates organically rather than dictated by sequelitis. It feels entirely appropriate that, having established how much Winston favours John (what is their connection? ), and – in the first movie – the penalty for killing on Continental turf, John should finish the picture burning his last bridge, a scene made so very satisfying for Scarmarcio smugly scoffing his dinner as it takes place, just as we know John has just imploded his world by doing so. So too, the “Be seeing you” signature sign off of those bound for the great beyond (spoken in sign language by Ares, another nice character touch: the subtitling is as distinctive as ever), and the returning Lance Reddick, this time fulfilling the Charon role by ferrying Wick to his demise (well, metaphorically) at the hands of Winston. 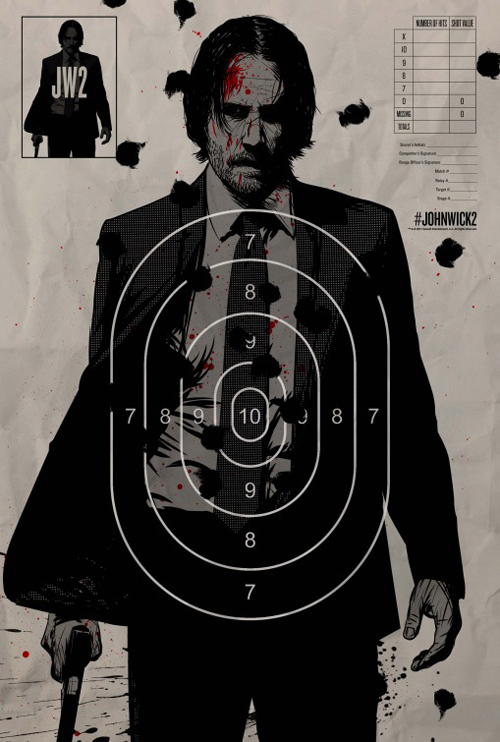 John Wick can’t die yet, of course. He still hasn’t named his dog. More of exactly the same aesthetic would have become boring, and Klostad and Stahleski have succeeded in increasing the scale without sacrificing the essentials, a very difficult juggling act. Perhaps the greatest dividends a reaped from the further exploration of the existentially fascinating world of the assassin. Even to the final scene, in which John’s meeting with Winston is seen to take place amongst a throng of passers-by, all potential killers, recalling the paranoid milieu of The President’s Analyst, but also the altered-world of The Matrix test programs, where time can be stopped with a wave of the hand, before slipping into Invasion of the Body Snatchers urban agoraphobia). John Wick: Chapter 3 has been set up to deliver and then some, and given how Chapter 2 has improved on the first, I don’t think we’re due a Matrix Revolutions in terms of that rare beast of Keanu trilogies. Now, if he can only get Bill & Ted 3 financed.